If you’re looking for a new way to keep fit or improve your footwork for a particular sport then skipping or jump rope carries many benefits. First of all if you don’t know how to skip then unfortunately it’s unlikely you’ll be able to just pick up a skipping rope, start skipping and have a great workout. You have to learn the correct technique first, this will ensure your workout is efficient and allow you to reap the benefits you deserve from skipping. This will also prevent you from working out with the incorrect or poor technique which can lead to injury. Fortunately I’ve made a video which is targeted at skipping for beginners that’ll show very basic skipping techniques that should be enough to get you started. 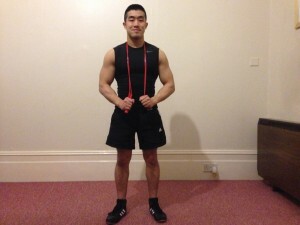 A skipping rope is a cheap but very useful piece of training equipment that can be taken pretty much anywhere with you, so check out the best skipping ropes so you can get started as soon as possible. If you’re passed the beginner’s stage at skipping and you need something that’ll take you to the next level then check out my jogging on the spot with a skipping rope video. First of all you’ll need to make sure the rope is the right length, if it’s too long it’ll hit the floor too early and just drag along the floor, if it’s too short the rope will just keep hitting your feet. It’s better to have the rope too long rather than too short so make sure you don’t cut too much of the rope if you’re going to shorten it. To check the rope is the right length, step on the middle and pull the handles up. The handles should come up to roughly around your armpits. Wearing the correct footwear may also make it easier to skip. Boxing boots or something similar would be ideal. Turn the rope using your wrists and keep your elbows tucked in. Jump by pushing off on the balls of your feet and also land on the balls of your feet. The balls of your feet is the top part of your feet just beneath your toes. Your feet should only come about an inch off the ground. Repeat this motion until you feel comfortable, then you can move on to the single footed skip. Be careful not to overdo it, this can lead to shin splints which would mean your training will have to come to a halt until your shins recover. As with the two footed skip, you need to jump by pushing off on the ball of your feet. Keep bouncing on the same feet a few times, then switch to the other foot. Once you feel more comfortable doing this try bouncing on each feet twice then switch to the other foot.